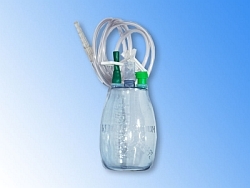 PFM HIGH-VACUUM DRAIN SYSTEM | ARKRAY, Inc.
200, 400, and 600 ml bottles are sterilised with Ethylene Oxide with the initial vacuum of 0.1 atmosphere. Made of crystal-clear material with rough and fine graduation, comfortable drain lock and integrated vacuum indicator. Drains for high-vacuum systems of 50 cm length are made of polyvenylchloride, free of latex, with the embedded X-Ray contract lines Sterilised with Ethylene Oxide, packed in two. Sales management in Poland is carried out by Color Trading Sp. z o. o.
Copyright© ARKRAY, Inc. All Rights Reserved.